Summer time BBQs are one of my favorite things! Friends, family, good food, cold beer, and a hot grill! We have put together some of our favorite BBQ main and side dishes to help make your next get together a little bit easier and a whole lot tastier! So happy summer and happy grilling! If you have ever made homemade seitan, then you know how easy it is! Well these ribs are just as easy, and so delicious. They grill up beautifully and will be a hit at your next BBQ with vegans and non vegans alike. If you have never had Alabama White Sauce then you are missing out. Its a creamy and tangy bbq sauce that makes these tofu skewers an all time BBQ fave. Just marinade the tofu in the Alabama White Sauce and toss it on the grill! The tofu is perfect on its own, on a sandwich, or on top of a salad. Creamy, tangy, sweet, and crunchy! What’s not to love about this delicious classic side dish gone vegan. It is so quick and easy to whip together and perfect as a BBQ side dish or quick lunch or dinner. Potato salad is one of my all time favorite side dishes. This southern dill potato salad is absolute perfection as far as I am concerned. It’s mayo and mustard based with diced dill pickles and red onions. One thing is for certain, there are rarely any left overs of this classic southern side! 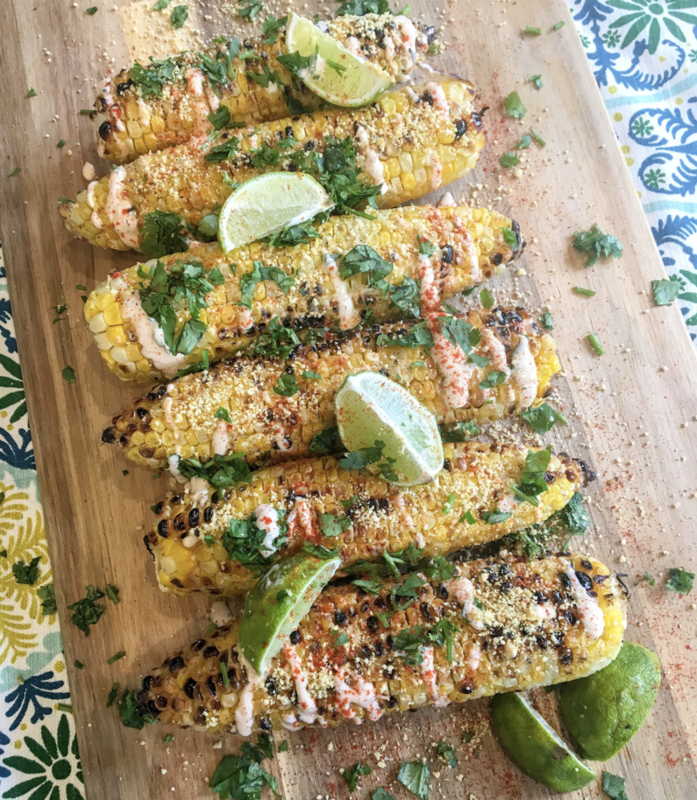 What is your favorite recipe to make in the summer months, when fresh sweet corn is in season? Mine is Elotes, or Vegan Mexican street corn. We have used vegan mayo and plain vegan yogurt to turn this popular street food into a vegan summer time staple. So fire up the grill and start shuckin’, because I promise you are gonna want to make this recipe all summer long! If you have been on the hunt for a healthy and hearty homemade veggie burger, I think we have what you have been looking for. This smokey, flavorful burger is packed full of veggies, with protein rich quinoa and black beans. This burger will leave you full, and satisfied with little guilt. Also try topping it with our smokey cashew cheddar for a super tasty cheese burger. They also freeze really well, so this veggie burger is also great for meal prep! So fire up the grill and give this healthy and delicious burger recipe a try! Hands down I would rather eat a carrot dog than a faux meat hotdog any day of the week. They are smokey, flavorful, and so good grilled up and topped with chili, slaw, sauerkraut, and any of your favorite hot dog toppings. I like to marinate a batch on the weekends so they are ready to go for the grill during the week! These vegan carrot dogs make for a quick, easy, healthy, and delicious lunch or dinner every time!